Concern about a potential blowout in the tunnel, located north of Leadville, was raised in early 2008 when high groundwater levels were suspected of building pressure from millions of gallons of contaminated water behind bulkheads in the tunnel and possibly leaking into surrounding areas. Since then, U.S. Sen. Mark Udall has tried to get approval for legislation that would give the Bureau of Reclamation authority to continue operating a relief well and to take steps toward a long-term solution. The Leadville Mine Drainage Tunnel Act would clarify that the Bureau of Reclamation has the authority to treat the water diverted into the tunnel and — if necessary — to expand on site to treat additional water. The bureau is also required to maintain the structural integrity of the tunnel to be safe over the long haul. Reclamation and the Environmental Protection Agency, which oversees mine drainage mitigation at a nearby Superfund site in California Gulch, have been unable to reach a long-term solution. 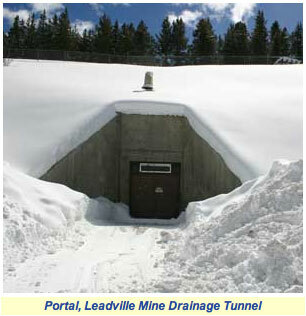 More Leadville Mine Drainage Tunnel coverage here and here. The bill also directs the Bureau to work with the Environmental Protection Agency to treat additional water from the Superfund site. The Bureau has done so in the past, but alleged that it does not have the authority to treat the water in perpetuity. But Olsen had no patience for federal agencies who won’t use their already-built plant to treat nearby contaminated water. “The plant is made to treat contaminated water entering the Arkansas River,” he insisted. “It’s a public plant.” Olsen added that he was “extremely hopeful” that Senators Udall and Bennet would be able to secure passage of S. 1417 in the Senate. More H.R. 3123 coverage here. A U.S. House bill ordering the Bureau of Reclamation to pump and clean the contaminated water in the Leadville Mine Drainage Tunnel was voted down Tuesday, largely by Democrats, including two from Colorado, in what observers suggest looked like clear political gamesmanship. Two bills have been introduced in this current legislative session. Lamborn introduced H.R.3123 and Udall introduced S.1417. Just like federal legislation introduced last year during the state of emergency, these are companion bills clarifying BOR responsibility for the tunnel and the water inside. Last year, the bill introduced in the Senate by former Senator Ken Salazar was halted by opposition from the BOR. The bill introduced jointly by the Congressman Udall and Congressman Lamborn made it to a vote in the House of Representatives. “The clock ran out,” said Udall about the lack of movement on this bill after the vote sent the bill to the Senate. The election loomed and the senate had a lot on its plate, and the bill was introduced rather late, he added.